Being his daily notes of his Campaigns in South Africa, South America, Portugal, Spain, Southern France, and Flanders, under Sir David Baird, Sir William Beresford, Sir John Moore, and the Duke of Wellington. 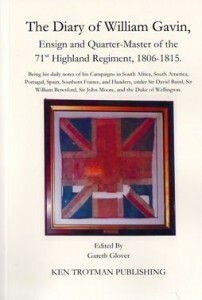 The Journal of William Gavin from 1806 to 1815 is quite a fascinating read on many levels, despite being the third memoir written by a Highland Light Infantry man to be published. Strangely, both of the previous memoirs are anonymous and both are unusually by rankers; being Vicissitudes in the life of an Old Soldier published in 1827 and the more recent Soldier of the Seventy First published in 1976. The text of William Gavins diary was originally published in the Highland Light Infantry Chronicle in 1920-21 by Sir Charles Oman, but this source is now extremely rare and difficult to obtain. Luckily a decendant Stephen Gavin (a great, great, great, great, grandson) has obtained a copy of the journal and I have used this as the base for this publication. William Gavin was born in 1775 and started in the regiment as a ranker and by 1806 he was Quartermaster Sergeant. As such he saw action with the regiment at the capture of the Cape of Good Hope and then followed the regiment on the ill fated expedition to Buenos Aires in 1807. He was at the capture of the city and also at the humiliating defeat that followed and went into capture in the hinterland (a not unhappy experience) but was finally released with the regiment following the defeat of General Whitelocks relief force. Gavin does record that ninety six men of the regiment chose not to return. Arriving home, the regiment was promptly sent to Portugal, where it saw fighting at Rolica and Vimiero and participated in the subsequent march into Spain and dreadful retreat to Corunna under General Moore. Gavin then followed the regiment on the ill fated Walcheren Expedition where few died in the fighting, but thousands died of some form of malarial disease. William was lucky to survive by drinking gin to combat the fever! Returning to Portugal in 1810, the regiment was involved in the harrying of Marshal Massena’s retreating Army back into Spain. Gavin went home that winter and did not return to the Army until July 1811, thereby missing the Seventy Firsts hardest combat at Fuentes d’Onoro. However, because of his close connection to his colonel, when Wellington announced that he wished to promote a man of the regiment from the ranks in commemoration of their brave actions, Gavin was promoted to Ensign despite not even being present! Movement from the ranks to the officer class were not as rare as readers may think, indeed William Anderson had been promoted from the ranks only the year before in the same regiment. Soon after, when a vacancy occurred in the 1st Battalion due to a death in the 2nd Battalion at home, Gavin was appointed Quartermaster to the battalion, which was still classed as an officer. As such Gavin followed the regiment on the march towards France in 1813 and witnessed the Battle of Vitoria at dangerously close hand, having only just escaped a lynching by wary Spanish peasants when sent alone to procure valuable salt for the men. At this battle William was a witness to the fatal wounding of his colonel, Cadogan, and his subsequent burial. The regiment marched on into France and was engaged at Sorauren, St. Pierre, the Nivelle, Orthes and Toulouse, when the war ended. However, having travelled back to their base in Ireland, they soon were sailing again to war. Rushed to Belgium the regiment played a significant part at the Battle of Waterloo and subsequent march on Paris. With the fighting finally ended, William Gavin quickly procured an appointment to the 4th Dragoon Guards on the retired list and settled down in O’Briensbridge near Limerick where he lived happily with his family until he died in 1834. Gavin’s diary is of great interest on many levels; his detailed accounts of the operations of the regiment and his descriptions of both the men and officers within. He was not a man to pull his punches and it is patently clear that as much as he adored Cadogan, he detested Nathaniel Peacock, his fellow colonel with just as much passion. He also openly describes the pillaging committed by the British Army on the road to Paris, including by the officers; debunking the Victorian ideals of the British soldier being perfect at Waterloo once and for all.